Isn’t all carpet the same? Why not just choose the style and color you like and be done with it? If you have gone carpet shopping lately you well know that there are now more carpet choices on the market than ever before. Let’s take a look at Eco-friendly carpets and some best practices for choosing an Eco-friendly carpet and why someone would consider eco- friendly carpet. 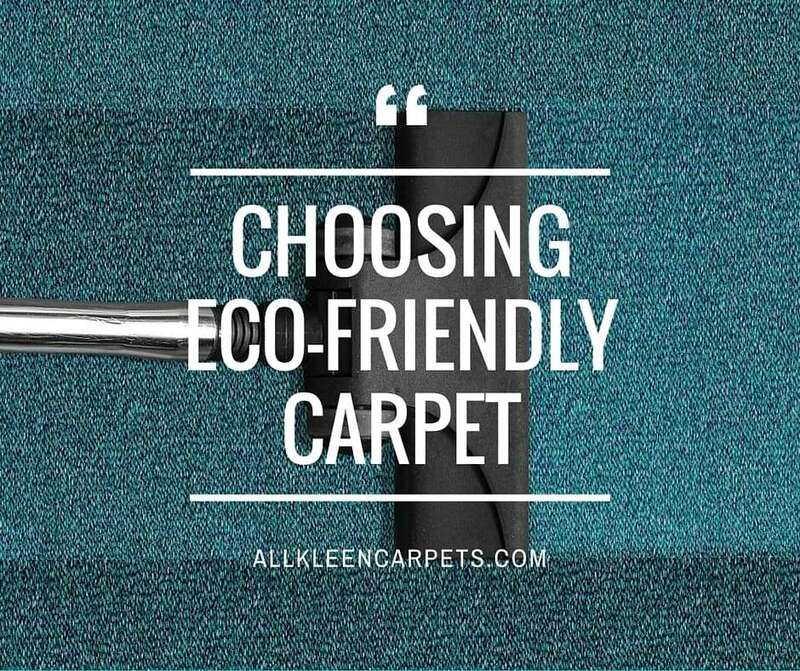 Why Choose Eco- Friendly Carpet? The smell of “new” has been marketed as a good and desired experience. For instance new car smell; it is so popular that they even make an air freshener labeled with new car smell scent. The smell of a newly purchased product can be satisfying,but it is not always healthy. This is the case with some new carpets. Many carpets on the market contain volatile organic compounds or VOCs.These are emitted from the carpet as gases and can have a negative impact on health when inhaled. Exposure to VOCs can cause a number of different symptoms including nose and throat irritation, headaches, allergic reactions on the skin, dyspnea also known as uncomfortable breathing, nausea, fatigue and dizziness. That new carpet smell in most new carpets is actually a VOC known as 4-phenylcyclohexene or 4-PCH. This chemical is a result of latex binder used to secure fibers to the carpet backing. The VOC lingers after home installation for up to a week exposing home residents to harmful products. So how do you avoid inhaling harmful VOCs? By purchasing eco-friendly carpeting. These carpets are often referred to as low VOC carpets and are much safer on everyone living in the home. Check carpet labels in the store and look to see that the carpet you are interested in has been tested by the Carpet and Rug Institute (CRI) indoor air quality testing program. If the carpet has been tested you will see a small green house with CRI inside. This symbol verifies that the carpet has been tested and approved for low VOC emissions. Air out your new carpet before installing it in your home. The company you purchase your carpet from will usually do this for you but make sure to ask just to make sure. Avoid carpet padding with styrenebutadiene rubber and go for a felt padding instead. For carpets requiring glue for installation; use low-emitting, non solvent adhesives. Be sure to stay on top of yearly carpet cleanings and routine home maintenance such as vacuuming to provide the healthiest living space possible. There are more and more environmentally, green, family safe products being offered in today’s marketplace than ever before and it’s a good thing. Did you know All Kleen uses “green” cleaning solutions? It the best way to care for your carpet and keep your home clean and healthy. Make an appointment online today.